This uncommon name is of Anglo-Saxon origin, and is a locational surname deriving from any one of the places called Hambleton in Lancashire, Rutland and Yorkshire. The place in Lancashire, near Garstang, is recorded as "Hameltune" in the Domesday Book of 1086, and that in West Yorkshire near Selby is also in Domesday as "Hameltun". These places share the same meaning and derivation, which is "Hamela's settlement", from the Olde English pre 7th Century byname or nickname "Hamel(a)", from "hamel", crooked, maimed, with "tun", enclosure, settlement. 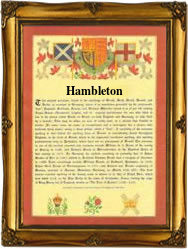 Upper Hambleton in Rutland appears as "Haeldun" in Domesday, while Hambleton Hill and Black Hambleton (one of the range of hills) in North Yorkshire are recorded as "Hameldune" and "Hameldon" respectively in the early 13th Century. These places are all named with the Olde English adjective "hamel", cut off, level, and "dun", hill, down, mountain. Locational surnames were used especially as a means of identification by those people who left their place of origin to settle elsewhere. Recordings of the surname from various Church Registers include: the christening of Robert, son of Robert Hambleton, in Aycliffe, County Durham, on September 1st 1573, and the marriage of John Hambleton and Agnes Cockin on February 28th 1589, at Beeley, Derbyshire. The first recorded spelling of the family name is shown to be that of John Hamblton, which was dated October 31st 1568, witness at the christening of his daughter, Anne, at Gainsborough, Lincolnshire, during the reign of Queen Elizabeth 1, known as "Good Queen Bess", 1558 - 1603. Surnames became necessary when governments introduced personal taxation. In England this was known as Poll Tax. Throughout the centuries, surnames in every country have continued to "develop" often leading to astonishing variants of the original spelling.